The loyal, courageous Australian Cattle Dog is a hard-working herding dog that was developed from the Dingo, the wild dogs of Australia. Ranked as one of the most intelligent breeds, the Cattle Dog loves to learn new skills, but can have an independent streak. Agility, tracking, herding, and advanced training will harness the Australian Cattle Dog's desire to work. An impressive energy level and drive make the Australian Cattle Dog an ideal companion for a household with an active lifestyle. Mouthiness and a tendency to bite or nip are often present in the Cattle Dog, so the breed may not be suitable for homes with children. The Australian Cattle Dog is also known as the Cattle Dog and ACD. Historical names for the breed include Australian Heeler, Blue Heeler, Red Heeler, and Queensland Heeler, and those names are still used to refer to the Australian Cattle Dog. Coat - The Australian Cattle Dog has a double coat, with a dense undercoat and a hard, short outer coat that lays flat. The hair is shorter along the head, legs and feet, and longer around the neck and under the belly. The water-resistant coat allows this breed to work in the rain. The coat colors are blue and red speckle. The blue can be solid, blue-mottled or blue-speckled with black, blue or tan markings on the head. The red speckle coat should have speckles all over, with darker red markings on the head permissible. Cattle Dogs are muscular and compact, giving the impression of a great deal of power and speed. They are intelligent and alert, with a graceful, balanced stride. ACDs are devoted to their humans and are happiest when spending time with them. The breed is wary of strangers, though they are friendly and playful once they become familiar with new people. In the 1800s, cattle ranchers in the Australian Outback found the sheep herding dogs they brought from England weren't well suited to the harsh environment. A period of breeding experimentation followed to develop a rugged herding dog who could manage large herds with a firm, but not overly aggressive approach. To create the first ancestors of today's ACD, a man named Thomas Hall crossed Blue Smooth Highland Collies with Dingos, Australia's wild dogs. Over time, the breed's working skills and temperament were refined through crosses with other breeds, including the Bull Terrier, the Dalmatian, and the Working Kelpie. The new breed's skills and lively personality eventually drew admirers around the world, and the American Kennel Club (AKC) officially recognized the Australian Cattle Dog in 1980. Australian Cattle Dogs are go-getters always ready for a challenging workday. They are exceptionally intelligent, and working ACDs are fully capable of controlling a herd without direction from their master. Independent and stubborn, Cattle Dogs require consistent training to ensure undesirable traits, such as nipping and excessive barking, are controlled. Above all, they are energetic and need an abundance of mental and physical exercise. Are Australian Cattle Dogs Good with Kids? ACDs are best suited for families with older kids who have experience with active dogs. This breed's herding instinct is so strong, they are known to 'corral' rambunctious little kids through forceful barking and nipping at heels. Are Australian Cattle Dogs Good with Other Pets? To be good with other dogs and cats, Cattle Dogs must be socialized with them from an early age so they accept them as pack members. Without this, ACDs are likely to want to herd and control other dogs and pets, which could lead to frequent hostilities. Cattle Dogs are protective of their herd and their pack. They control their aggression, however, until a threat is deemed imminent. Are Australian Cattle Dogs Good Guard Dogs? ACDs make exceptional guard dogs and watchdogs. They will naturally patrol their property and alert their pack when danger approaches, and become aggressive if they perceive a threat. The heightened protectiveness of the breed makes socialization critical, so they understand when strangers pose a threat and when they don't. Cattle Dogs were bred to have the energy and attentiveness to herd cattle over large spaces for long periods of time. ACDs have boundless stamina and it's important they are paired with an active family who is happy to spend time exercising with their dog. The American Cattle Dog requires a lot of exercise. He will resort to destructive behaviors without activities to expend excess energy and combat boredom. He has a herding instinct, which can include heel nipping and barking. He needs a lot of training and socialization so his herding instincts are restricted to working hours. ACDs stick close to their owners. Don't expect much alone time if you bring one into the family. Indoor Though Cattle Dogs have a weatherproof coat, they should live indoors. This breed gets very attached to their families and they don't take kindly to being apart from them for very long. They shed seasonally, so there are periods when fur around the house is minimal. Outdoor Because of their abundance of energy and need for mental stimulation, ACDs should spend plenty of time outdoors either at work or play. Make sure you have quality rain and winter gear so you can take them outside when the weather is bad. Cattle Dogs are already equipped with a rugged, rain-proof coat and they can get antsy if stuck indoors for too long. Exercise The Australian Cattle Dog will not be satisfied with a few leisurely walks a day. This breed requires frequent mental stimulation and physical exertion. ACDs are happiest with a job to do, whether herding cattle or wrangling balls in the yard. Endurance These high-stamina herding dogs can go from sunup to sundown. Running Miles: A healthy Australian Cattle Dog is an an eager running companion and will enjoy runs upwards of five miles. Hiking Miles: ACDs can easily manage half-day hikes, or full-day hikes with some rest stops. Food Australian Cattle dogs require approximately 1½ to 2½ cups of high-quality dry dog food each day, given in two meals. Because activity levels can vary significantly between dogs, be sure to talk to your veterinarian about the best amount of food for your Cattle Dog. Alone Time It doesn't take long for Cattle Dogs to become antsy when left home alone, and they will turn to destructive behaviors to pass the time. This may include nuisance barking and destructive chewing. Crate training your ACD can minimize damage, but this breed should not be left alone for more than an hour or two. The Cattle Dog's close, weatherproof coat also resists dirt, making grooming a breeze. Brush your ACD two days a week most of the year, and a bit more when he fully sheds his undercoat twice per year. The Cattle Dog requires a bath about once a month. Keep an eye on his ears for signs of infection and clean them occasionally with a gentle cleanser. Clip his toenails about once each month. You can minimize serious health concerns in a Australian Cattle Dog by purchasing from a reputable breeder who engages in responsible breeding practices, and through screening for common diseases and conditions. 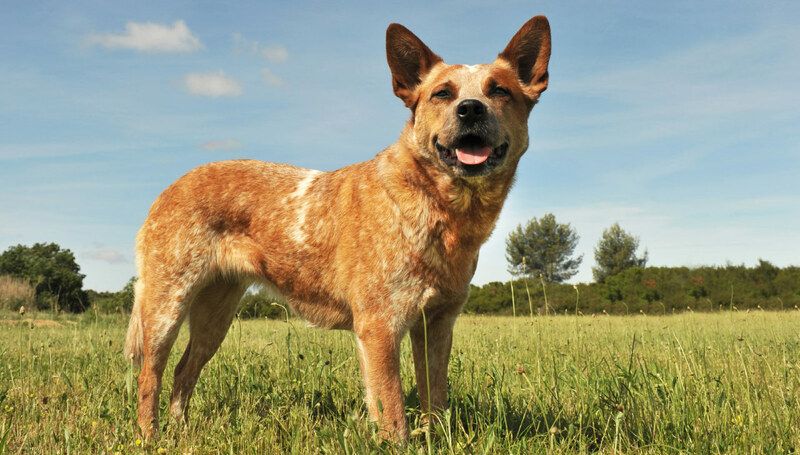 Australian Cattle Dogs are highly intelligent and will learn the basics quickly. Because they are also independent, stubborn, and sensitive to harsh reprimands, they learn best with plenty of positive feedback and rewards of dog treats. ACDs are eager to please and adore being put to work. They make excellent pupils in advanced obedience training, and are great at sports, including herding, agility training, and tracking. Cattle Dogs are bred for herding, so they aren't natural hunting partners. Do Australian Cattle Dogs Shed? Yes. Australian Cattle Dogs shed heavily twice each year when they 'blow' their undercoat, and then shed lightly through the rest of the year. As a result, they are not considered a hypoallergenic breed. Shedding releases pet dander into your home, which is the cause of most pet-related allergies. Do Australian Cattle Dogs Like Snow? Australian Cattle Dogs love playing, and if playtime happens in the snow they are all for it. Though the ACD coat is not adapted specifically for snowy, cold climates, it resists water and will protect the dog in the snow for play or work, as long as it is not for hours on end in frigid conditions. Australian Cattle Dogs enjoy swimming. Playing fetch in the water or dock diving are good activities to keep your ACD active when it's hot out.